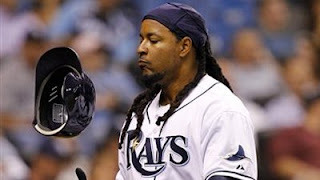 Five games into his one-year, two million dollar contract with the Rays, Manny Ramirez's brief tenure in Tampa is over. MLB said Friday it notified Ramirez of "an issue" under its drug program and that the longtime slugger decided to retire instead of continuing with the process. Ramirez would have faced a 100-game suspension if he hadn't retired, because he tested positive for a banned substance, according to Bill Shaikin of the LA Times. It would have been his second major drug-related suspension. Back in 2009, he was suspended for 50 games after a positive drug test. Tampa Bay was basically blindsided by all this. "We are obviously surprised and disappointed by this news," the club said in a statement. "We will have no further comment on this matter." Despite the fact that his stay in Tampa was short, I'm sure Ramirez would rather just forget the entire ordeal altogether. He went 1 for 17 with a single and an RBI, while getting booed by his own fans in the process. Not exactly the kind of thing in which fond memories are made. I suppose you can mark this down as the final chapter of the "Manny being Manny" saga. He ends his 19-year career with a .312 batting average, 2574 hits, 555 home runs, which places him 14th on the all-time list, 1831 RBI, a .411 on-base percentage and a .585 slugging percentage. Not that he had much of a legacy left, but what was left is now ruined. Bet Tampa wishes they never even fooled with bringing him there.